Now that the ISBHF World Masters Championships are over and it is just local players involved the ignored Bermuda Ball Hockey Association’s Winter League season is underway. 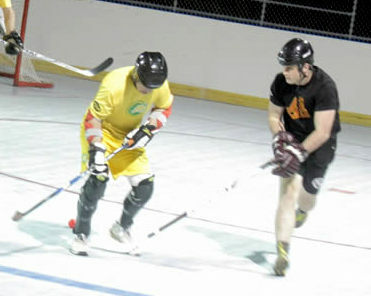 A total of nine goals were scored in a double header at the PCC Hockey Rink. At the end of the First Period the score was deadlocked at 1 – 1, the Guelph Storm took the lead with a Christopher Merritt goal, but Rimouski Oceanic drew level when Craig Macneil found the back of the net. Only one goal was scored in the Second Period with the Guelph Storm taking a 2 – 1 lead with a strike off the stick of Nathan Kowalski. Rimouski Oceanic drew the match level at 2 – 2 in the Third Period when Josh Bush scored, but the Guelph Storm winner would come when Kowalski scored his second goal of the game. Ross Rufiange would lead the Calgary Hitmen to a 3 – 1 victory over the Worchester Railers with two goals, while Jeff Morash added the other for the Calgary Hitmen, with Joel Neal scored the lone goal for the Worchester Railers.